Atom bank, the UK based challenger back acquired Grasp, a design and development house. 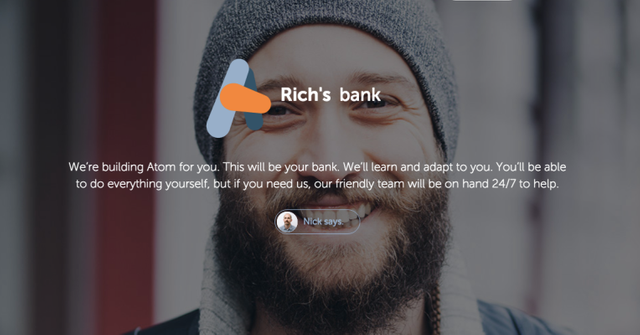 Last year, Atom received $128m in funding, led by banking giant BBVA . Terms of the deal are not being disclosed, an Atom spokesperson told me. Grasp had already been working with Atom as an outside agency, creating the “shop window” for Atom, in the words of Edward Twiddy, Atom’s Chief Innovations Officer. So this is partly about bringing more of that relationship in-house to work on deeper projects. As part of the deal, the head of Grasp, Brian Jobling, will become Atom’s business development director. Grasp bills itself as a provider of “bespoke digital services for the banking industry”, but as Atom points out it has worked on projects also for car-centric organizations F1 and NASCAR, as well as MTW and the James Bond franchise.